WHAT'S CHINESE NEW YEAR WITHOUT A DRAGON? 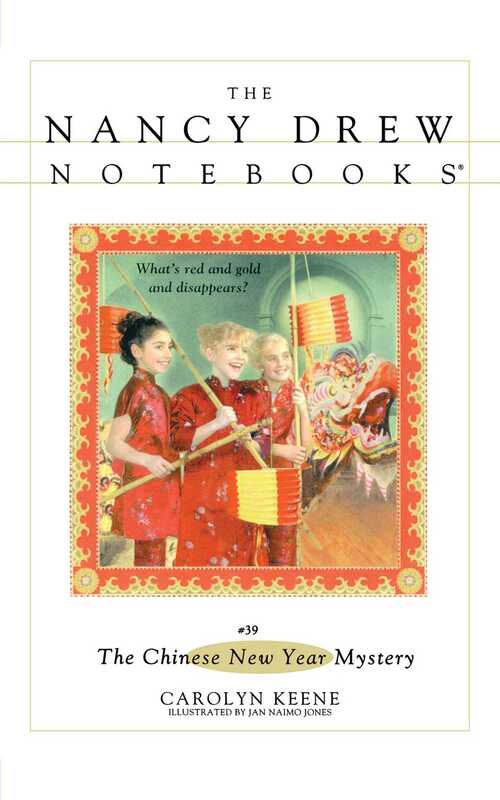 The third-grade classes at Nancy's school are learning about Chinese culture, and they'll celebrate the Chinese New Year with a special parade. The highlight of the parade will be a dragon costume. Nancy's class is making it out of feathers, sequins, gold tassels, and red silk. But right before the big day, the dragon disappears! Nancy, Bess, and George are in the New Year's spirit. They've enjoyed a delicious feast at the home of their classmate Mari Cheng. She's even lent the girls special Chinese outfits to wear. But without the dragon, there will be no parade. And that makes Nancy roaring mad! "Gung Hay Fat Choy!" eight-year-old Nancy Drew said to her best friend Bess Marvin. Bess sat down at her desk, which was across the aisle from Nancy's. The two girls were in Mrs. Reynolds's third-grade class at Carl Sandburg Elementary School. The first bell of the day was about to ring. Bess frowned at Nancy. "Gung what?" "It means 'Wishing you good fortune and happiness' in Chinese," Nancy explained. "That's what people say for Chinese New Year's. Mari taught me." At that moment Mari Cheng walked into class. She gave Nancy and Bess a little wave. The school bell jangled noisily. All the students took their seats. Mrs. Reynolds went to the front of the classroom and said, "Good morning, everyone!" "Good morning, Mrs. Reynolds," the class said all together. "First I want to tell you about a special art project we'll be doing with Ms. Frick starting tomorrow," Mrs. Reynolds announced. "As you all know, we've been studying Chinese culture for the last month. And this week is the beginning of the Chinese New Year season." George Fayne raised her hand. George was Bess's cousin and Nancy's other best friend. "But we already had New Year's," George said, looking puzzled. "It was on January first, right? So how can this week be the beginning of the Chinese New Year season?" "I know! " Orson Wong was waving his arm. "Yes, Orson?" Mrs. Reynolds said. "The Chinese New Year is different," Orson said. "It goes on for weeks. We celebrate it at our house. First my mom and dad make us clean the whole house with them. But then we get to eat lots of food, and the kids get red envelopes full of money." "Thank you, Orson," Mrs. Reynolds said with a smile. "Orson's right, class. The Chinese New Year season starts about ten days before their New Year's Day, and goes on for a few weeks after that. It's practically a month-long event." "Cool!" Mike Minelli said, grinning. "Do we get a whole month off from school?" Mrs. Reynolds shook her head. "Sorry, Mike." "Too bad," Mike said, making a face. "The Chinese year is based on the lunar calendar," Mrs. Reynolds went on. She picked up a piece of chalk and wrote the word lunar on the blackboard. Next to it she drew a picture of the moon. "Lunar as in moon," she explained, turning to face the class. "Each month of the lunar calendar begins with the new moon. That happens every twenty-nine or thirty days. Not like our months, which can be thirty-one days long. Which means that as far as we're concerned, the Chinese New Year falls on a different day every year. On the other hand, our New Year's Day is always on January 1"
She added, "Also, each new year has a name based on an animal. The year of the Dragon, the year of the Rat...there are twelve animals in all." Bess raised her hand. "So what's our special art project, Mrs. Reynolds?" "Some communities mark the end of the Chinese New Year season with a dragon parade," Mrs. Reynolds replied. "Even if it's not the year of the Dragon. For the Chinese, the dragon represents strength and brings good luck. A couple of people wear a big dragon costume. Everyone else follows them with lanterns and banners and masks." Her eyes twinkling, she added, "Mrs. Apple and I decided that our two third-grade classes will have a dragon parade two weeks from today. Her class will make the lanterns, banners, and masks. Our class will make the dragon." A dragon! Nancy thought. That seemed like a really cool project. She tried to imagine a dragon so big that more than one person would have to carry it. All the kids in the class started buzzing excitedly about the dragon parade. Then a loud voice drowned out everyone else's. "Two weeks from today? No way! It has to be on a different day." Nancy turned around in her seat. The loud voice belonged to Brenda Carlton. "Brenda, is there a problem?" Mrs. Reynolds asked her. "I won't be here that Monday," Brenda complained. "My mom and dad are taking me out of school to go to Wisconsin. There's a big party for my grandparents' wedding anniversary." She crossed her arms over her chest and glanced around the classroom. "I'm sure everyone agrees that we can't have the parade without me." Bess rolled her eyes at Nancy. Brenda always acted like she was the most important person in the whole world. "Your father spoke to me about that," Mrs. Reynolds told Brenda. "I'm sorry, but the date can't be changed. The parade is going to be in the gym after school, and that Monday is the only day the gym is free." "But that's totally not fair!" Brenda cried out. "I know. But I'm sure you'll have fun helping the class make the dragon," Mrs. Reynolds said. "Anyway, you'll all be starting the dragon project tomorrow in Ms. Frick's art class. Right now let's get back to our lesson on Chinese culture." Later, during lunch, Nancy sat in the cafeteria with Bess and George. They munched on their sandwiches and talked about the dragon parade. "I saw a picture of a dragon parade once," George told her friends. "My parents took me to Chinatown in Chicago last summer," Bess said. "They had the coolest clothes stores there!" Nancy took a sip of her milk and smiled. Bess was really into clothes and shopping. George wasn't like that at all. She was much more into sports and stuff like that. Sometimes it was hard to tell that the two of them were cousins. Just then Mari came up to the table where the girls were sitting. Mari smiled shyly at them and said, "Um, do you want to come to my house for dinner tonight? Afterward, we're going to do this special ceremony -- the Kitchen God ceremony. It's to start the Chinese New Year season. Anyway, my parents said it would be okay if I invited all of you." "Sounds great," Bess said eagerly. "I'll just have to ask my parents." "Me, three," George chimed in. "Great. You can come over at five," Mari said. "I think the Chinese New Year is stupid." Nancy turned around in her chair. Brenda was sitting at the next table with her best friend, Alison Wegman. Alison was in Mrs. Reynolds's class, too. It was Brenda who had spoken. Mari's brown eyes grew enormous. She looked as though she was about to cry. "I-it's not s-stupid," she said to Brenda in a shaky voice. "Well, I think it is," Brenda insisted. "Why should I help the class 'make a dragon when I'm not even going to be here for the parade? I think the whole thing is stupid!" "Just ignore her," Nancy whispered to Mari. But Mari didn't say anything. She just gave Nancy and her friends a little wave and headed for the cafeteria line. "Why does Brenda have to be such a baby about everything?" Bess complained. It was a few minutes before five. She, George, and Nancy were heading up the walk to Mari's house for dinner. They were all looking forward to the special New Year's ceremony. Nancy stuffed her hands into the pockets of her blue parka. The air was cold and crisp. There was still snow on the ground from a storm the week before. The girls' boots made loud crunching noises as they walked. "Brenda's just mad because she can't be in the parade," Nancy said to her friends. "She was really mean to Mari," George pointed out. "I know. She shouldn't have made fun of the Chinese New Year," Nancy said. The Chengs' house was brick with bright red shutters. In front were lots of bushes. Their dark green branches were covered with snow. As the girls got close to the door, Nancy heard a rustling noise in the bushes. "What's that?" she whispered to her friends. "It's probably just a squirrel," George replied. She reached up to ring the doorbell. But before she could do that, the rustling noise grew louder. The bushes began to shake, and a puffy cloud of snow rose in the air. All of a sudden, something jumped out of the bushes toward the girls. It was a weird creature with a tiger face! Copyright &copy; 2000 by Simon &amp; Schuster, Inc.